Our BSc student Samuel Cairns analyses the Austrian election campaign and the impact of Freedom Party Leader H.C. Strache. This October will see three charismatic, outspoken and intelligent candidates go head to head in a race to become the next Austrian Chancellor. 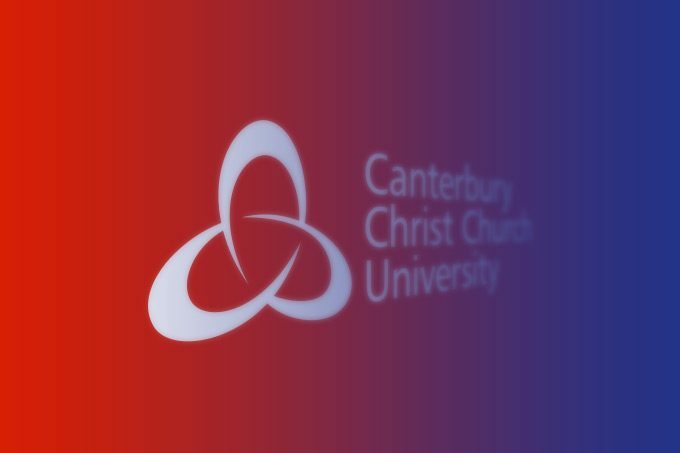 Of course, it would be inaccurate to suggest there are only three candidates running for Chancellor on October 15th, while there are in fact nine candidates representing nine different parities. Of those nine parties, there are only three whose leaders look likely to make a significant impact in the incoming election – Sebastian Kurz from the ÖVP (Austrian people’s party, centre-right), Christian Kern from the SPÖ (Social Democrats, centre-left) and Heinz-Christian Strache from the FPÖ (Freedom Party, far-right). These three parties dominate Austrian media and election campaigning. With tens of millions of Euros in campaign funds and donations in the bank, the ÖVP, SPÖ and FPÖ are able to completely dominate election campaigning, forcing the smaller parties into submission. This phenomenon could be witnessed over the course of the current election campaign with regard to the Greens, NEOS and Pilz, which all descended towards the 4% threshold as their supporters appear to migrate mainly to the ÖVP and SPÖ. In fact, the most recent opinion poll from OGM/Kurier puts the support of these three parties between the 4-5% range each. If this poll holds true on election day, then it would be a monumental 7 point drop for the Greens and a loss of 15 seats – a green catastrophe. Logical speculation suggests that these lost voters would have either migrated to the SPÖ or Pilz as they are the most ideologically similar to the Greens. However, closer inspection of the polls show that another phenomenon is taking place, that is the Strachification of the Austrian election. This describe a process where supposedly liberal voters of left-leaning parties are now leaning towards voting for either Kurz (ÖVP) or Strache (FPÖ), the two dominant right-wingers in the election. It is conceivable to suggest that roughly 3.5% of this Green cohort have migrated to either Kurz or Strache while the other 4% have chosen either Pilz or the SPÖ. This unusual choice of migration of these liberal voters can be attributed to the development of the wider Austrian election campaign. What started as a campaign focused on lowering the already low rate of unemployment (8.3%) has transformed into blatant immigrant-bashing and trying to outcompete each other on who can sound the most Islamophobic without having to present any actual policies. Strache seemed to have this election in the bag at the turn of 2017, he was unabashedly anti-Islam and equally anti-immigrant. After reeling from a close defeat to Green candidate Van der Bellen in last year’s presidential election, the Freedom Party and subsequently, Strache spent time refocusing their agenda preparing for elections in 2018. Despite the close defeat in the presidential election, the Freedom party had a lot to look forward to – they were polling around 10 points ahead of the Social democrats in the polls and the SPÖ-ÖVP coalition was in crisis; neither party could seem to agree on a coherent migration and asylum policy for fear of losing more voters to the Freedom Party. The Freedom Party had also earned the accolade of being Europe’s strongest and most influential far-right party. However, fast forward to May when the youthful foreign minister Sebastian Kurz became the new leader of the ÖVP, the polling dynamic completely changed. Kurz quickly denounced the coalition between his party (the ÖVP) and the SPÖ, meaning new elections were called for this October. He was also able to almost flip the ÖVP’s and FPÖ’s polling figures overnight, propelling the ÖVP into an instant first place while the FPÖ fell back to a contentious second with the SPÖ. 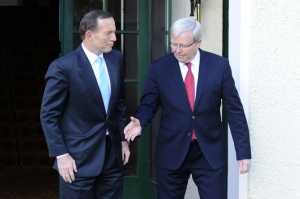 Many commentators attributed this phenomenon to be the ‘Kurz effect’; however, I am more sceptical. Yes, Kurz’s youthful figure and charismatic aura certainly helped him become the leading figure in the election but there was, in my opinion, a more important dynamic that propelled him to first place. This was when he cleverly adopted the rhetoric of the radical right. Kurz, already infamous for closing off the Austro-Italian border in 2016, then unashamedly went on a tirade against Islamic Kindergartens, EU immigrants, Viennese Mosques and just about everything ‘non-Austrian’. 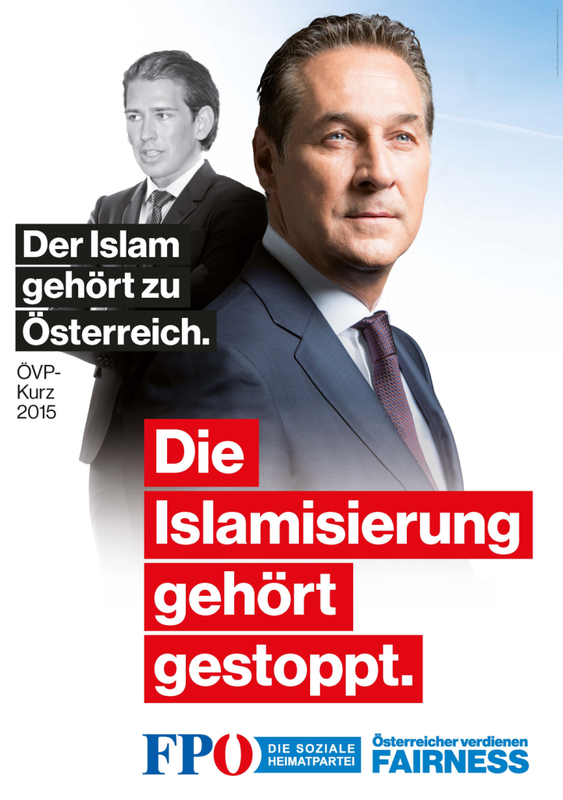 It even got so extensive that the Freedom party, ironically, complained that Kurz was stealing their election manifesto as his and Strache’s rhetoric seem almost identical. Thus, I contend that these developments are linked to what I call the Strachification of Austrian society, whereby Strache’s heavy right-wing influence over certain sectors of Austrian society has forced other party leaders to adopt his radical rhetoric, particularly on immigration and the position of Islam in Austrian society. 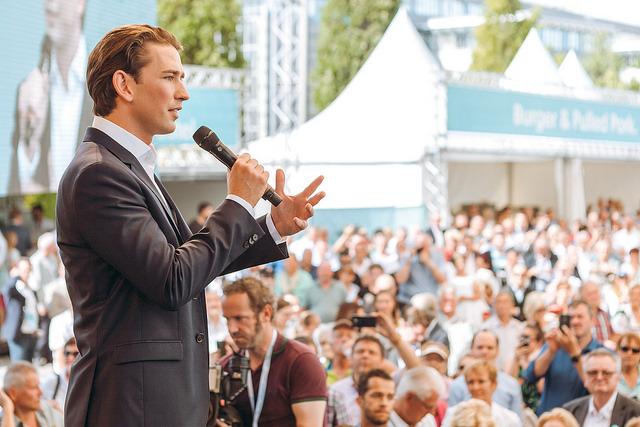 Kurz in particular has taken this as an opportunity to rejuvenate the ÖVP (which also fights the election under the new name “ÖVP – Liste Sebastian Kurz”) and at the moment it seems to be working. Until election day nothing is clear, but one thing is certain – Strache and the FPÖ may no longer be leading election polls, but their influence and inflammatory rhetoric has quite abruptly dragged the official discourse of this small alpine nation to the right.